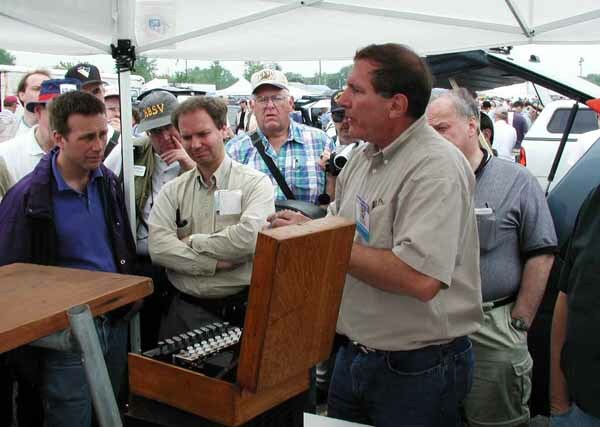 The Dayton Hamfest is the largest and best attended hamfest in the world. It is always exciting and has gradually evolved into not only a productive place to hunt for keys, but also a social gathering place for key collectors. Dayton, however, is right in 'Tornado Alley' and the ferocity of the storms that pass through is impressive. arrived in the rain at 9AM (27kb) to begin setting up my tents and found a large group of collectors already scouring the flea market in search of goodies. Gil Schlehman and my wife Gretchen helped me set up my three 10X10 foot tents and rope them all together and to the 8-foot canopy and to my trailer and station wagon and Gil's big station wagon. As the sky darkened and the threat of rain increased we made a mad dash to get all the key boxes on the tables and to cover them with poly tarps. About 1PM it became obvious that we were in for a very serious thunderstorm and the leading-edge roll cloud hit with unbelievable gusts of wind. Karen, Russ' wife, Gil, My wife, several onlookers, and I each grabbed a leg of my tent system and held on for dear life. At one point, my wife was lifted several feet into the air by my tents which were trying to take off and fly back to Vermont... Gil grabbed her just in time to prevent her being blown down the road. The entire 40-foot tent system moved about 10-feet downwind breaking ropes and dragging my trailer after it. Gil jumped into his station wagon and pulled it upwind of the tent system and we roped the tents to it for the rest of the blow. Dozens of tents could be seen flying through the air, the sounds of breaking glass filled the air, and the tops were torn off two of my three tents but the keys and all of the people who helped keep them on the ground survived, and we were able to walk the tents back into place when the wind died down and was replaced with a continuous soaking rain that continued into early Saturday. The glass front on one of my permanent museum display cases had shattered and I was unable to stand the cases up and put the usual signs on each case for the rest of the hamfest but aside from that and a bunch of soaked books, we survived the storms pretty well. 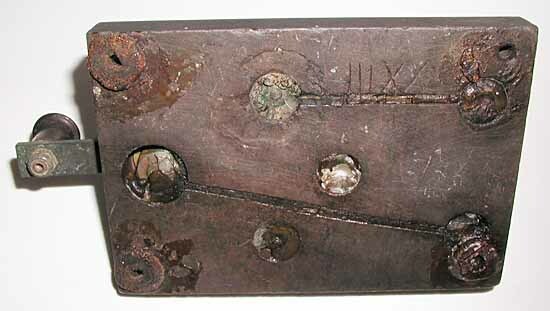 Collector Doug Palmer showed up with a magnificent and extremely early Caton- lever key... 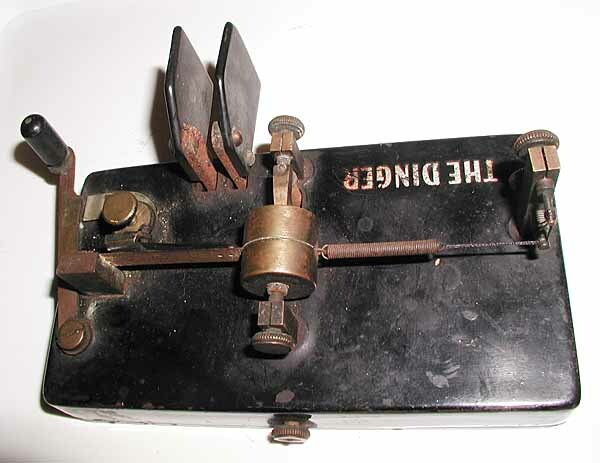 The lever was absolutely fantastic and clearly showed the name of the maker...but, unfortunately, the rest of the key must have been lost somewhere because the beautiful lever was mounted in a standard oval Triumph style base.. Nevertheless, it was certainly one of the best early landline finds of the show. super-clean Codetrol bug (12KB). This was the first Codetrol that I have been able to diddle... and it was surprisingly crisp and precise. I would rate its 'feel' as being among the very best of any bug I've had my hands on. Unfortunately, there don't seem to be many of them around and, according to Gil, the number may be as few as 4-6. 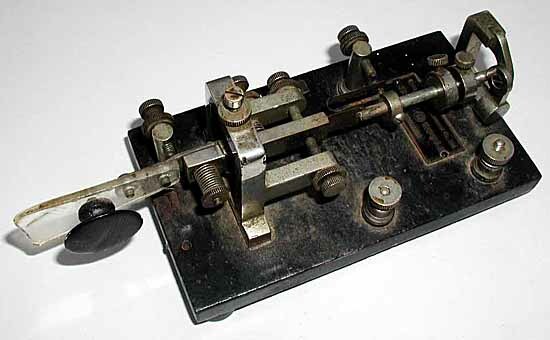 Spark Key with a captive round ball contact (22KB) also changed hands during the afternoon but most collectors were disappointed that only a few common keys were showing up due to the rain that kept most (tentless) sellers from putting out items for sale. 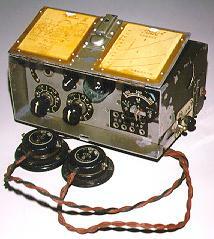 right-side view of the second Peerless bug (53KB). I dont know where the first one originally came from but I was told that the second one came from the internet... (not ebay!). 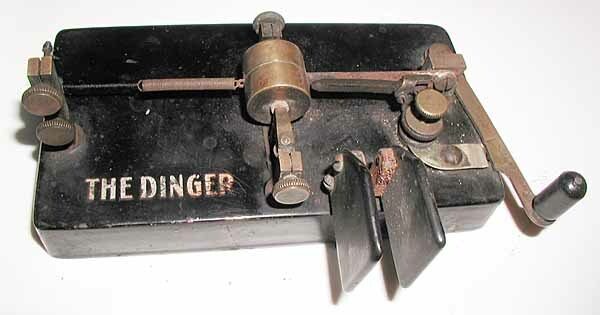 Gil Schlehman found a nice Go-Devil Bug which he needed for a trade and a nice super-early Tillotson weight-driven register which came from another collector in a trade. Janne, SM5LNE, made the trip all the way from Sweden in hopes of finding a vertical vibroplex or some other key of similar rarity. 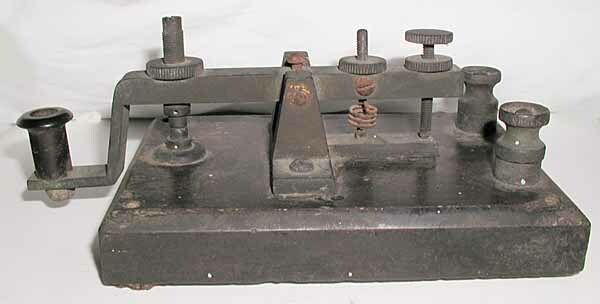 He was kind enough to bring his extremely early 1850's vintage straight lever American landline key for me to see, compare with my two similar camelback keys, and photograph. 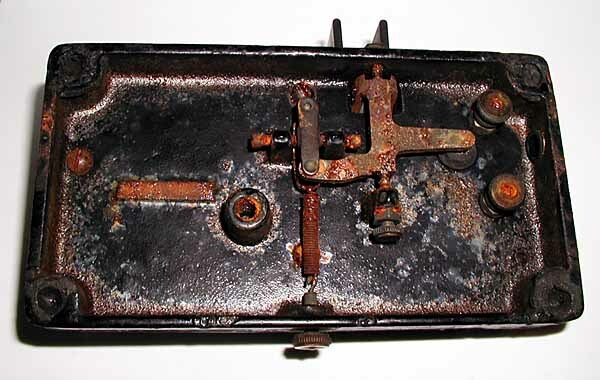 We were able to determine that his key originally had a circular safety-pin style spring by noting that one of mine had similar holes in its base. 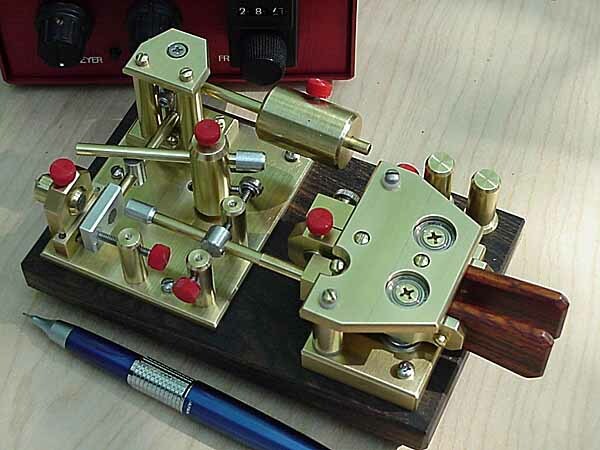 Although he did not return to Sweden with a vertical, he said he enjoyed the hamfest and bought a wonderful new paddle. 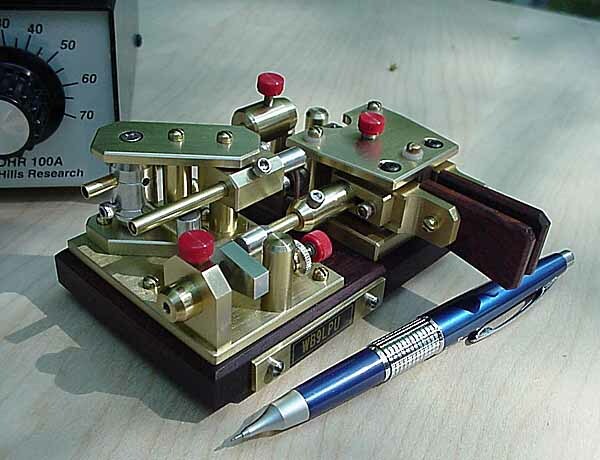 Eastern Precision Spark key (17KB). 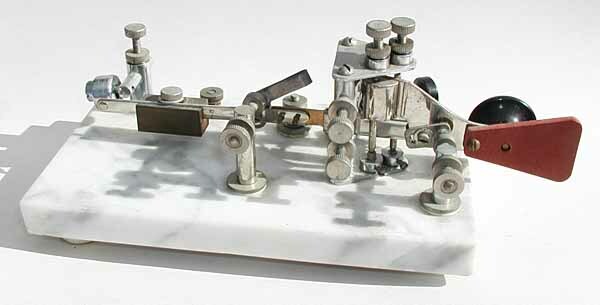 He also brought along a tiny working Triumph-style brass key which was no larger than a thumbnail for show-and-tell... 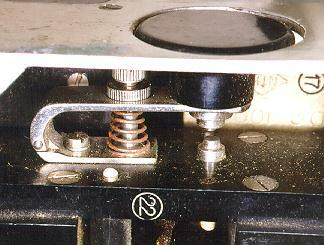 He bought some nice early CQ magazines and put them under my tables for 'safekeeping'. The next HEAVY rainstorm put the pile in several inches of water and turned them back into wet wood pulp before we realized they were there and tried to rescue them. 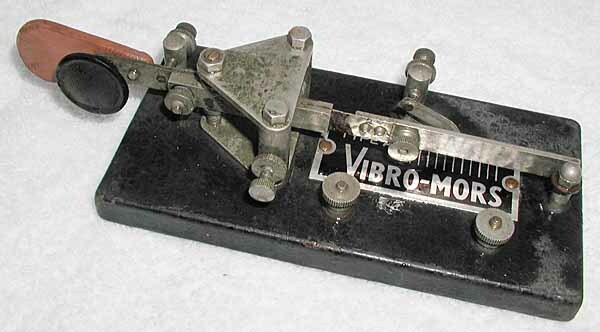 another view (30KB) of the Vibro-mors. These bugs are not super-rare in Europe but it is unusual to see them in America. 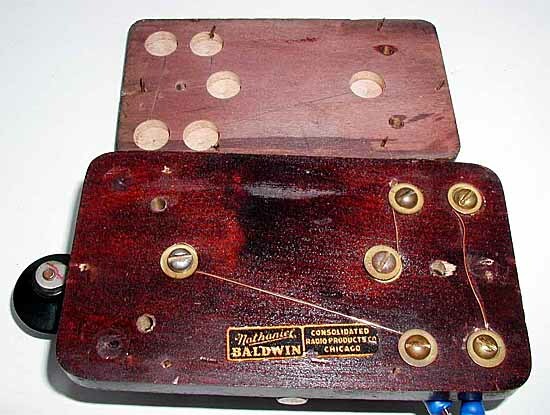 a photograph of the base and sub-base and decal (47KB) on the Baldwin Key. Many hundreds of friends and collectors stopped by to say hello and to show off their finds. A surprising number of people are building their own keys and using very unusual design strategies and they came by to show off their latest models and munch the slightly soggy pretzels. Richard Meiss, WB9LPU certainly took the prize for having the most original and functional bug designs! This amazing bug (42KB) uses magnetic repulsion and has an unbelievably light touch. This bug has a very similar design and a wooden base(41KB). his personal pages on my website. 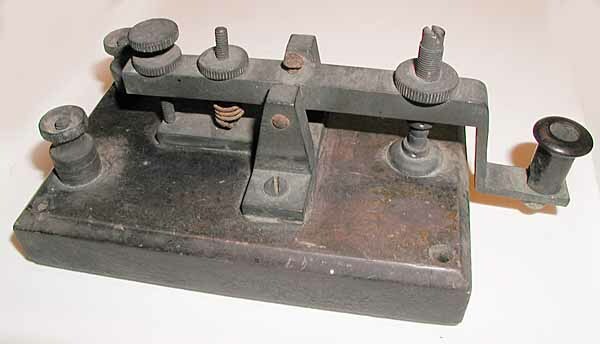 Mitch, K4OA, the president / owner of Vibroplex told me that the company is seriously looking to borrow a Vertical and perhaps a Midget so that they can put these historic keys back into production. If anyone would be willing to loan him a Vertical, it would be very much appreciated. He will insure it for whatever you wish and take esppecially good care of it. 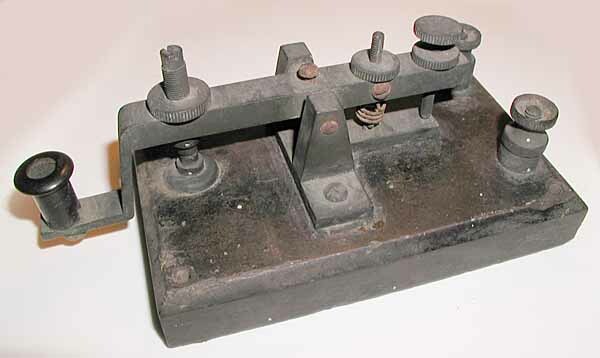 He is of the opinion that it will actually increase the collectibility of the original ones by letting more people know about these keys and he thinks that a lot of hams would like to have one on their operating table. Let me know your thoughts on the Vertical project. 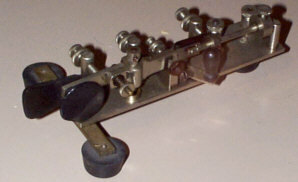 Vibroplex introduced a very small hand key at the Dayton 2001 hamfest and it was selling very well throughout the show. 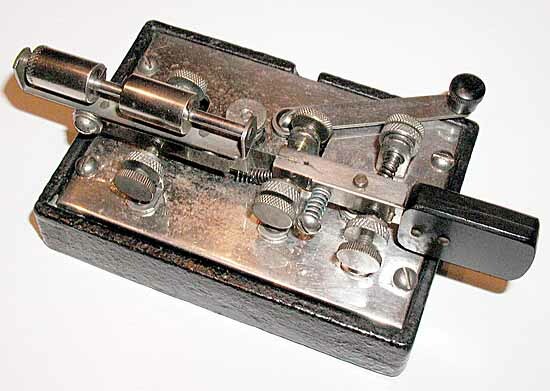 It is nicely sized for QRP operation but, with the light plastic base, it tends to 'walk around' the operating table unless weighted or stuck down. 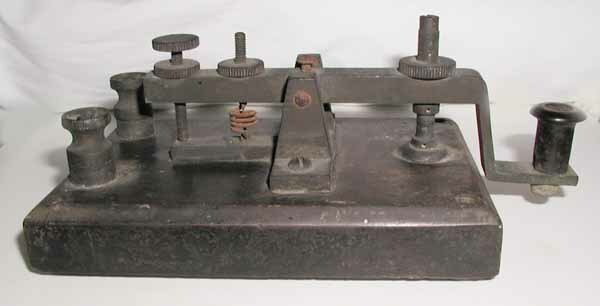 hourly lectures and hands-on demonstrations of the enigma machines (37KB). 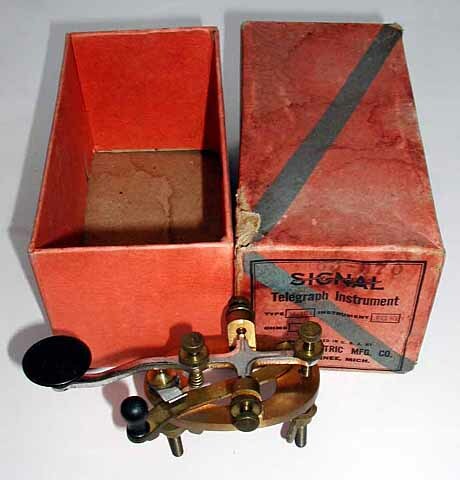 While he was giving one of these demonstrations, I noticed that a fellow across the way had put an original Norden Bombsight on his table and I rushed over to add it to the collection of critical WW-2 technology on my tables. 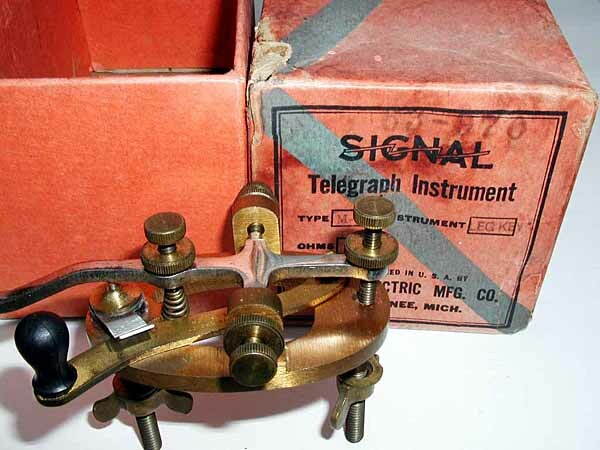 Only at Dayton could you hope to find Enigma machines, Norden bombsights, and historic telegraph keys on display. I think that it is this amazing variety of toys that keeps people coming back year after year and braving the infamous "Dayton weather". At one time a crowd of about 50 people stood in a teeming downpour listening to the Enigma demonstrations. The Saturday weather was much better and only a tiny bit of rain fell. Tentless dealers who had been unable to sell for two wet days cut prices in a desperate attempt to make up for lost sales. People turned out in droves to make up for missed buying and the general mood was happy and bustling. 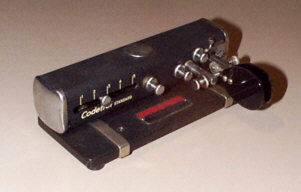 Spy Key built right into the set (22KB). These sets are becoming very hard to find and he must have been very sharp to be able to buy this one since they are in great demand among military collectors. 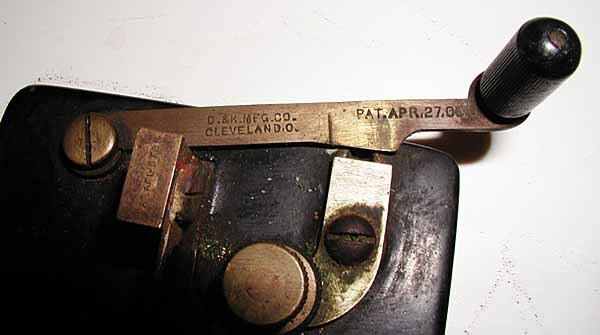 a closer view of this key (45KB)showing some of the details on the box label. 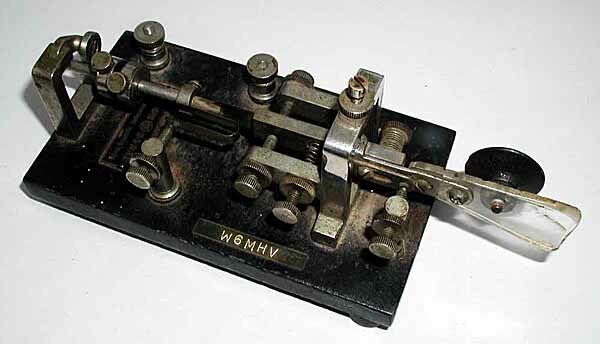 I had never come across the original box for a leg key before and was interested to see that it had a place for listing the 'ohms'. I guess that means that the same box was used for the company's sounders and relays. 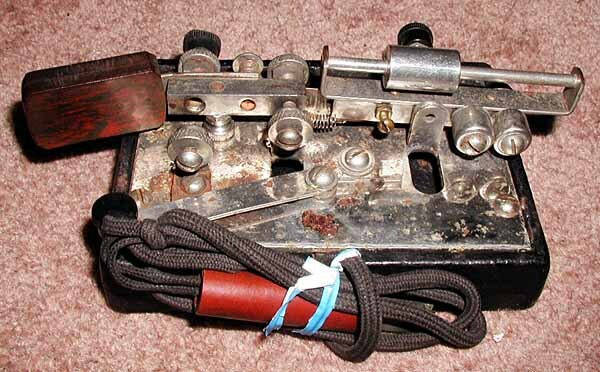 Joyce also found a J-6 WW-1 Aircraft key, a nice old Blue Racer, a French Military Key, a British Aircraft light signalling key, and several other goodies to add to her collection. Lynn Burlingame put in a surprise appearance and we all had fun talking with him and comparing notes. Joyce signed up for the keyletter and I think Lynn may have talked her into doing some research for a future article. Sunday is usually a slow day at Dayton but with the missed oportunities on Thursday and Friday, Sunday was exceptionally busy. 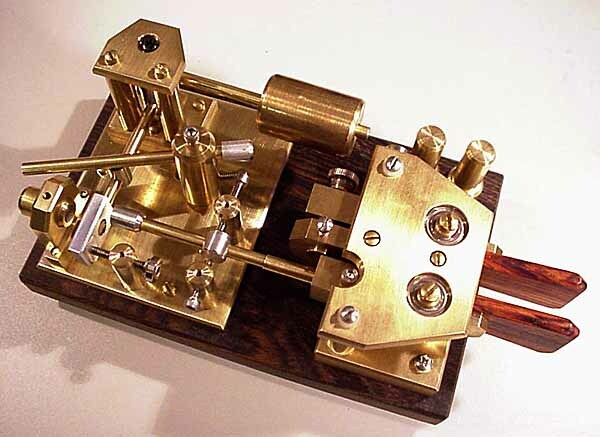 In fact, it turned out to be one of the most exciting days I've ever had at the hamfest. The crowds were immense, the food dealers ran out of food and the Port-a-Potties overflowed. Despite this, the mood was happy and, with most collectors having left, I went out hunting for goodies. 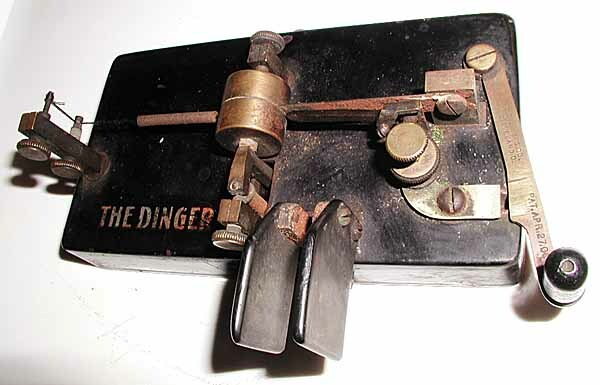 Although the Dinger is not considered extremely rare, it was the first one that I had ever found and I really like the action and the mechanism. It is fun to watch that silly weight bouncing back and forth on the string and the feel is surprisingly light and precise. I think it will be one of my favorites on the operating table. As the day wore on, I decided to go inside the main buildings to look at the neat new Yaesu 817 mini HF/VHF portable. As I was walking around and looking at the various dealers' tables, I noticed a dirty old thing sitting next to a beat-up Heath VFO, a pile of wire, and some other stuff. When I got closer, my heart started going into serious palpitations because I could see that it was a very large and very old spark key. 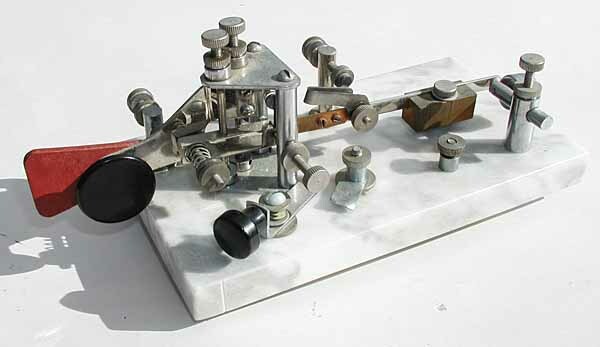 It is a great source of amusement and amazement to me to realize that this key was sitting out in plain view of 30,000 hams for 4-days and that nobody had bought it. I am not going to mention which table it was on... just in case another one should show up next year but let me just say that EVERY ham interested in CW would probably have looked at this table. I personally think that the explanation is that most hams are not particularly interested in very early keys and that collectors just assume that there will be nothing of interest in the commercial exhibit areas. 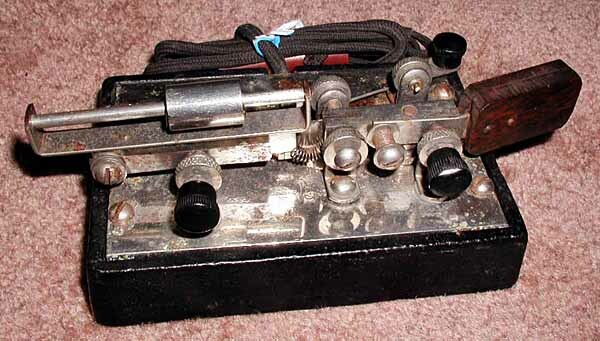 Here are some pictures of the key. Those are the things I remember from the hamfest. I hope you will email reminders of anything I've left out.